Forest Watch confirms Dr. Rock’s belief: students and their teachers can do real science. Their findings, observations, data and field samples have made a significant contribution to longterm research regarding ozone and its effects on the New England forest. 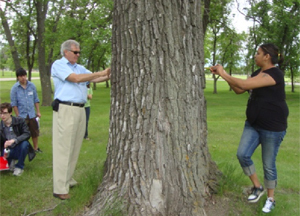 Dr. Rock and Melissa Baca measure the diameter at breast height of a cottonwood tree in Bismark, ND. Forest Watch measures of DBH on 79 white pines in 2008 shows that most of our trees are fairly young, just 30cm in diameter. Forest Watch is also built on the belief that universities, centers of learning, teaching and research, have an obligation and a privilege to share their knowledge, skills and discoveries with the public that supports them. That’s outreach. What is “inreach”? At Forest Watch, teachers and students reach into the University of New Hampshire whenever they wish. Students often email Dr. Rock or Forest Watch coordinator Martha Carlson with questions. Why did needles fall off the white pines in May rather than September? Sometimes we have the answer and email right back, building a conversation with students while they are in class doing a Forest Watch lesson. At other times, when students stump us, Forest Watch taps into the vast resources of UNH to find the answer. The Forest Watch conversation brings UNH to the classroom. Students get to know a state university, a professor, research staffers. Forest Watch has opened windows for many students on summer enrichment programs, college admissions, and careers in science. Inreach also highlights the power of citizen scientists. Many scientific issues today, especially a regionwide phenomenon like atmospheric chemistry, benefit from measurements and regular observations in many many study sites. 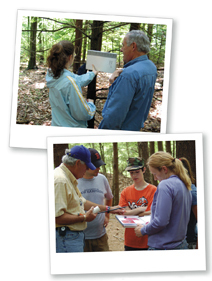 The numerous Forest Watch schools provide invaluable data about conditions and forest health across New England. For example, Forest Watch data tracks ozone conditions along the I-95 corridor, through the Connecticut River Valley and on the coast of Maine. Recent discoveries of change in those patterns indicates that a longterm study such as Forest Watch needs to continue.